Water Based Gilding Size dries to a crystal clear, extended tack in 20-30 minutes. Once it has reached tack, Water Based size will allow you to apply leaf for over 24 hours in a dust-free environment. This product is intended for interior work, but it can be used outside if not applied where it will be in direct contact with the elements. This water-based size has a mild odor and is non-flammable, making it a better choice where the oil-base size may cause problems. Unlike Oil Base Size, Water Based Size may take months to completely dry. 1. Preparing the item to be gilded is the key to a good gilding job. The surface must be clean and free of oils, wax, fingerprints and dust. After a good primer is applied to the item to be gilded, it should be sanded and made smooth filling in any porous areas. Make sure that your primer is compatible with the substrate. 2. Water Based Gilding Size can be applied with a brush, roller or be sprayed. After about 20-30 minutes, when the size changes from opaque to clear, it is set and ready to be gilded. 3. Once the size has set, you will have about 24 hours to apply the leaf. The set time and the gilding time will vary depending on the temperature, humidity, and thickness of the application. A good test to see if the leaf can be laid is when the size turns from opaque to clear. Water Based size can stay tacky for a very long time, depending on temperature and humidity conditions. 4. 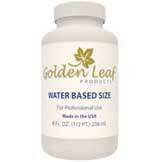 If the Water Based Size needs to be thinned, a small amount of water may be added. Best results are obtained with a thin even film. When using a brush, a good quality latex brush should be used. If rolling, a high quality short nap roller cover is best. When spraying, follow the equipment manufacturer recommendations. A. Coverage is about 75 square feet per quart, 35 square feet per pint, 18 square feet per 1/2 pint and 9 square feet for 1/4 pint. B. Water Based Size will freeze. Store in a heated area. C. Clean up wet size with water. D. A temperature of 65-75 degrees Fahrenheit and a relative humidity of 40-60% will yield the best results. KEEP PRODUCT OUT OF REACH OF CHILDREN! When spraying equipment is used, the operating instructions of the manufacturer must be followed. Only use this product in an adequately ventilated environment. Proper respiratory, eye and clothing protection should always be worn.